Amazon is back yet again with another sale called Amazon Fab Phones Fest sale which is slated to commence from next week onwards. The e-commerce giant will be hosting the sale from April 11 to April 13, 2019. The 3-day sale will bring exciting discounts and offers on smartphones, mobile accessories and much more. Here's an excellent opportunity in case you missed on the previous sales. The e-commerce giant has been teasing the sale with some exciting deals that is scheduled to go live from April 11, 2019. Huawei P30 Flagship Smartphone To Be Launched in India on April 9; Will Be Retailed Exclusively Via Amazon.in. 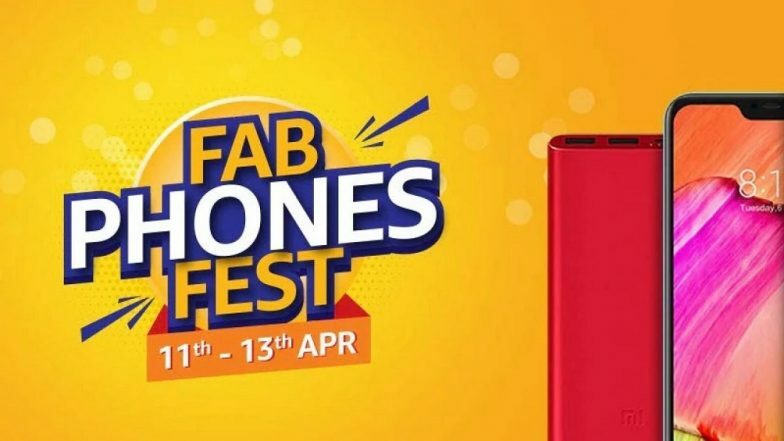 The Fab Phones Fest sale will also bring discounts on mobile accessories such as cases, power banks, headphones, chargers, selfie sticks, and much more. As a part of the sale, online marketplace claims to offer the lowest price ever on OnePlus 6T whereas the landing page of the sale states the sale will bring the biggest ever offer on the flagship device from OnePlus. On the other hand, Apple's iPhone X will also be listed online with an attractive price of Rs 74,999 during the forthcoming sale. However, the online marketplace hasn't revealed the final discounted price for iPhone X. But, we certainly know that the phone will be offered with no-cost EMI. As a reminder, Apple is currently offering heavy discount on iPhone XR along with attractive cashback offers for HDFC Bank customers. It is also important to note that Select Honor smartphones will also be part of Amazon's forthcoming Fab Phone Fest sale. As per the Amazon's landing page, the e-tailer will be looking to lure the customers with deals on Honor smartphones worth up to Rs. 8,000. During the sale, the smartphones from Oppo will be listed with an extra discounts under exchange offers. The company will also be offering deals on Realme U1 smartphone. The company will also be offering bundled offers on all smartphones alongside flat discounts. These offers will include total damage protection plans, no-cost EMI options, exchange offers and much more. Moreover, Amazon India has also collaborated with Cashify wherein the customers will get 6 percent extra value on their smartphone.